Please note that the content of this book primarily consists of articles available from Wikipedia or other free sources online. Hay Creek is a small trout stream in southeastern Minnesota. It has its headwaters near Goodhue, and empties into the Mississippi River just upstream of Red Wing. It runs approximately 20 miles, over half of which is a Minnesota designated trout stream. 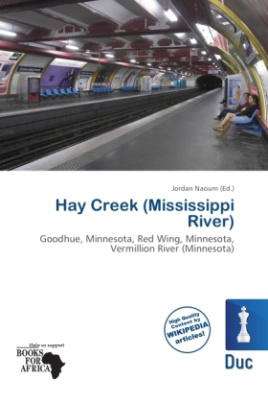 Like the Vermillion River, Hay Creek receives extensive fishing pressure due to its proximity to Minneapolis-St. Paul. A railroad once ran along Hay Creek from the claybanks near Goodhue to the pottery and stoneware factories in Red Wing, which also made use of the water from the creek.